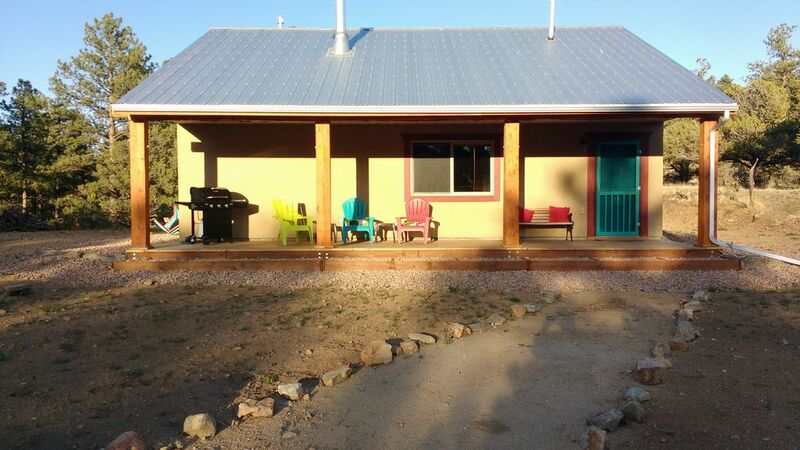 Experience Piñon Flats, a two bedroom, one bath, full kitchen cabin/casita, sleeps 6 nestled in the beautiful Wet Mountains. A great off-the-grid vacation get-away from cell phones and Wi-Fi. (There is a DVD player and MP3 player.) Awesome star gazing in the wide-open dark night sky. Enjoy watching Wet Mountain cloud formations and Golden Eagles throughout the day while relaxing on large redwood deck! Wake up to the panoramic view of 9,000' McKinley Mountain. Make your own meals in the full kitchen with the unique gathering table for six or cook outdoors on the 3-burner propane grill. Sleep comfortably in the queen bed, single bunkbeds or double bed futon. Winter months evoke the use of the efficient wood stove and/or propane heating for cozy warmth. Fire wood is supplied. On sight horseshoes. Out-the-door hiking on our surrounding private property or just relax in the hammocks. We completed the casita construction June 2017. It was a husband and wife effort and a lot of work, but there was never a day we didn't say "we built here because we found a spot on this earth we want to be at all the time!" Mountain living is the place to be for us who originally came from North Dakota and Ohio/Michigan/New Mexico. We generally will be at our cabin across the road at 1790 Durfee Circle. We used to love camping in the area, but campsites were consolidated and hard to find, so we bought a piece of land to camp on. One thing led to another, thus the casita VRBO building project! Bathroom towels provided, please do not remove from casita. No hairdryer provided; just step outside in the mountain sunshine and breeze. If you bring your own hair dryer, use sparingly about 3 minutes. This is a tank-less hot water system. May need to run water a bit to get hot and then it is HOT. Shampoo, conditioner, bar soap are provided. Silver Cliff and Westcliffe are just 30 minutes away via scenic Highway 96 west. There are many summer activities, restaurants, art galleries and historical sites. The Pinon Flats casita at Rancho Arturo is set amongst many pinion trees at 8400'. Every direction is a scenic view of the Wet Mountains! Fabulous dark, night time skies offer great star gazing! Please do not remove from casita. Wood burning stove. Wood supplied. 14 cubic feet electric refrigerator with freezer. Gas 4-burner stove. Outdoor 3-burner BBQ grill. Gas indoor stove with broiler. Everything needed to cook a meal. Full Kitchen: refrigerator, gas stove, dishes, silverware, linens, cookware, 4.5 Qt. Crock Pot, coffee maker, toaster, Britta Filter pitcher (good for making coffee.) You just need to bring the food! Large, hand-crafted table seats 6 to 8. For the DVD player in casita. Silver Cliff and Westcliffe are 1/2 hour drive away for restaurants, art galleries, museums, grocery store, access to Rainbow Trail in the Sangre de Cristo Mountains. Other sites: Lake DeWeis for boating and fishing, Mission Wolf tours, Bishop's Castle. We had an absolutely amazing time at the Casita!! Very clean and cozy, Doug and LeAnn have thought of everything to make your stay fantastic! We definitely enjoyed not having WiFi or Cell service; it allowed us to spend amazing quality time with our kids playing games, watching movies and exploring outside when it wasn’t snowing!! We will definitely be returning in the future!! Our family of 5 had a great time at this little cabin -it was just the vacation we needed. We went for walks, played games, watched movies, read books, and took naps. One thing to note, which is clearly called out in the listing, but that we just overlooked, is that there in not a microwave (maybe because the cabin is all solar), so no microwave popcorn for us -but that didn't stop us from having a great time! A big thanks to Doug and LeAnn for sharing their little cabin with us. Thank you, Matthew and all, for experiencing Pinion Flats at Rancho Arturo! You are correct about no microwave due to the solar power system, so we will be adding a Whirly Pop soon! We loved staying. It was a wonderful getaway. Thank you for your review! It was so nice to meet you and we are glad you had a great day skiing at Monarch. Hope to see you again! LeAnn and Doug for sharing this special place for others to enjoy. We'll be back! Very clean and well equipped! Perfect location! We had a fabulous time at the cabin and exploring the surrounding areas. Tranquil, breathtaking views, and remote yet close to snow activities, We highly recommend this cabin! We will definitely be back. We thoroughly enjoyed our stay at Doug and LeAnn's casita. They were so kind and helpful. It's on a beautiful piece of property, very secluded and relaxing. We loved our hikes on their place, it has wonderful views!! The casita is very clean and stylishly decorated. It was supplied with everything we needed to prepare our meals that we brought with us. If you are looking for some things to do close by, we highly recommend Bishop Castle, and a scenic drive to Canon City via Oak Creek Grade. We hope to stay again soon. And as someone else mentioned in a previous review, the table really does glow in the dark!! ATVs are allowed on Custer county roads! Please let us know the number of ATVs in your party to be respectful of our neighbors. FISHING at Lake DeWeese, San Isabel Lake and Grape Creek. HUNTING ZONE 69 is minutes away. Bishop's Castle is 25 miles east on 96 to 165 south.